RIPESS-NA (Intercontinental Network for the Promotion of the Social Solidarity Economy - North America) initiated the process of organizing this forum. RIPESS-NA members include the U.S. Solidarity Economy Network (SEN), the Canadian Community Economic Development Network (CCEDNet) and the Chantier de l’économie sociale in Quebec. 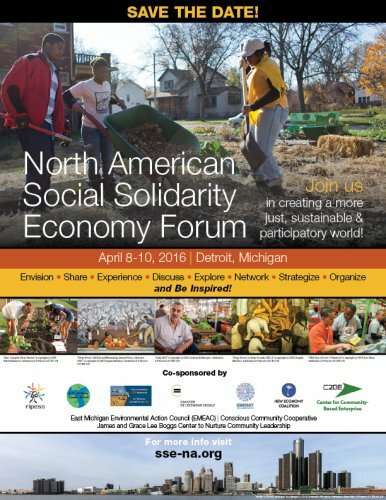 The North American Social Solidarity Economy Forum is a collaboration of numerous other like-minded actors and allies, including the Democracy Collaborative, the New Economy Coalition, and Detroit organizations, including: the James and Grace Lee Boggs Center to Nurture Community Leadership, the Center for Community Based Enterprise (C2BE), the East Michigan Environmental Action Council (EMEAC), and the Conscious Community Cooperative. The Forum is an opportunity to build a common understanding about the solidarity economy, while at the same time respecting the differences grounded in the specific history, culture, language and economic/political realities of different places. RIPESS’ Global Vision statement provides a starting point for discussion and exploration. We hope to explore in greater depth important yet underdeveloped concepts and realities such as the role of the solidarity economy in addressing issues pertaining to race/ethnicity/culture, class, gender, rural/urban development; the macro-economy; and the environment. This is also an opportunity to explore the common ground between the solidarity economy and other frameworks such as community wealth building, the social economy, green, popular, community, sharing and cooperative economies. This topic would be well suited for a plenary with breakouts in order to foster a common base of understanding.